PacktPub.com this week launched its inaugural Content Management System Award with a prize of US $5000 to the winning project, second prize $3000 and third prize $2000. Read more: Upgrade to Joomla! 1.0.10 Security Release! Core team member Mitch Pirtle has hit the virtual newsstands in a big way as the cover story author of this month's International PHP Magazine. Mitch was invited to put pen to paper about forthcoming Joomla! technologies and proved a more than worthy scribe, as evidenced by landing the front page. He manages to encapsulate a lot of technical terms into a very good read for Joomla! users of all levels of expertise. 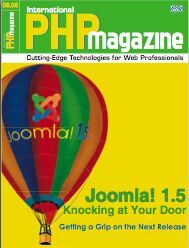 If you're wanting to know what's changing in Joomla! or what advantages there are in the new version over the 1.0 series, Mitch takes all of this in his stride covering the power of the API, new templating system, internationalisation and much more. Sure, some of you already know all this and that Joomla! is the best open source CMS on the planet, but you can always use a high-quality feature such as this in your Joomla! brag book. International PHP Magazine has provided this download link for a FREE sample of the entire article. Read more: Joomla! 1.0.9 out now!! Joomla! 1.0.9 will be released on Monday June 05, 2006. Please note: no specific time has been set for the release, so it may become available at any time on the 5th.